An aerial view looking west toward the town of Marathopoli and Proti Island. The photo is from the website for Marathopoli’s Artina Hotel Nuovo, where we stayed two nights while visiting historic sites, towns and attractions on a road trip through the Messenia region of the southwestern Peloponnese . Great location: I didn’t know anything about Marathopoli when our travelling companions suggested we use the small seaside town as a base during two days of our road trip in the Messenian region of the Peloponnese last spring. Quite frankly, I didn’t know exactly where it was or what was there, and I doubt I had even heard of the place before they mentioned it. What we discovered when we got there, on Day 2 of our trip, was a quiet, laid-back town that was a perfect spot to unwind after busy days of driving, hiking and sightseeing. And, just as our friends had pointed out, it was very conveniently located. All of the major attractions we wanted to see — Methoni Castle, Voidokilia beach, the old castle of Navarino, and the town of Pylos — were less than 40 minutes away. Many more historic sites, beaches and natural attractions we didn’t have time to visit were within reasonable driving distances as well, including The Palace of Nestor; Golden Beach – Mati and Vromomeri beach; and the Valta waterfall, Neda River, Polylimnio lakes and waterfalls, Gialova wetlands, and more. From a tourist perspective, Marathopoli isn’t a particularly remarkable town in and of itself. 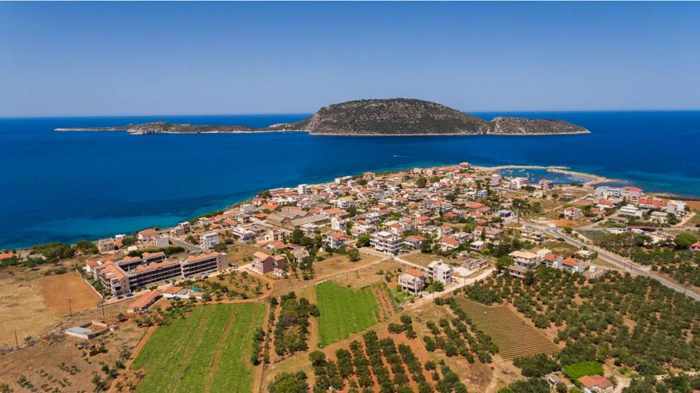 Although it’s located on the coast, the built-up area of businesses and residences is spread across flat terrain, so it doesn’t boast a naturally picturesque and scenic setting like the more famous Messenian hillside towns of Pylos and Kyparissia. Its streets aren’t as photogenic, since there are no cobblestone lanes lined with rustic old houses and impressive historic buildings to stroll around. 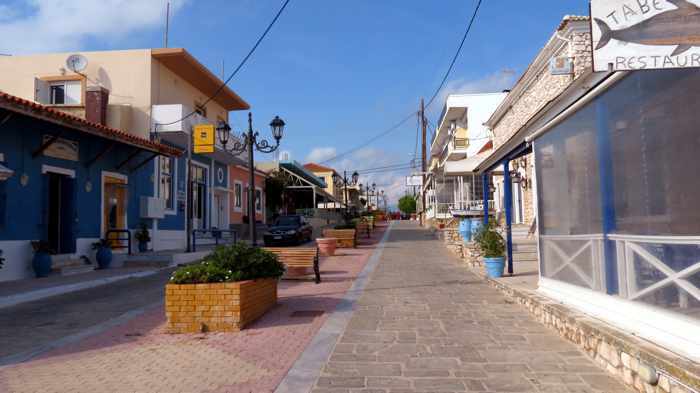 However, Marathopoli does have an attractive pedestrian zone just off the main drag, where visitors will enjoy going for coffee, drinks or dinner, or to take walks with views of the sea and Proti Island. One block, which leads from the main street toward the sea, has been pleasantly landscaped with brick and flagstone pavement, benches, planter boxes, and old-style streetlamps. Restaurants, a few shops and a bank occupy the buildings along both sides of the block. 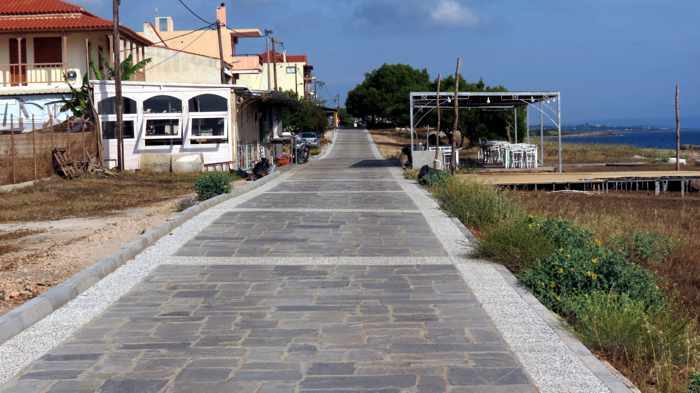 The street intersects with a flagstone-paved pedestrian walkway (Πεζόδρομος — pezodromos) that extends along the seafront all the way to the town harbour. 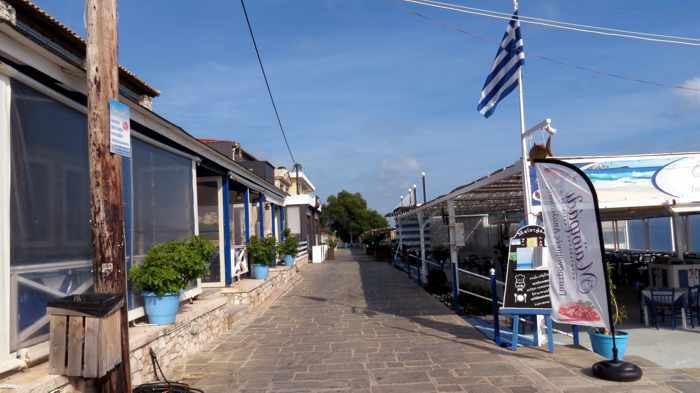 Locals refer to it in English as The Sidewalk, and it is the town’s go-to area for a good selection of fish tavernas, traditional Greek restaurants, coffee shops and bars, many of which have open-air patios along the seafront. We found the pedestrian areas incredibly quiet in daytime and early evening, but humming with people and activity at night, once all of the restaurants had opened. If you’re planning to travel in western Messenia and looking to stay in a mellow, realxed location with appealing attractions close by and plenty more within reasonable driving distance, take a closer look at Marathopoli. For us, its location just couldn’t be beat. Our only regret was that we didn’t spend another night or two there; we never made it to Lagouvardos, and at the time of our late May visit the tour boats to Proti Island had not started operating. But we did enjoy the town’s unhurried, low-key atmosphere, excellent dining, and beautiful sea and sunset views. For additional information about the town and top attractions nearby, check out the official Marathopoli Tourist Guide as well as as Jessica’s excellent overview article, Marathopoli and the beautiful surrounding area in Messenia, Greece, from the Athens Coast lifestyle website. To see more of Marathopoli, take a look at the aerial video below, then turn to page 2 where I have posted photos that we shot while wandering around the town and enjoying the almost traffic-free streets.